Arsenal manager Unai Emery has reportedly instructed club officials to deny Joachim low’s entry on the training ground to speak to Ozil. The 29-year-old midfielder retired from international football this summer after a dismal World Cup with Germany in Russia, which saw the 2014 winners knocked out in the group stage. Ozil cited racism within the Country’s ranks regarding his Turkish roots as one of the reasons for his departure, which Low described as ‘exaggerated’ in the days after the announcement was made, as Metro Sport reports. However, according to Bild, it appears that the Germany head coach is ready to let bygones be bygones, having flown out to London to speak the Arsenal star face to face. The German publication states that Low and Oliver Bierhoff made moves to arrange an audience with Ozil, but were shut down by Arsenal officials when they tried to contact the club. 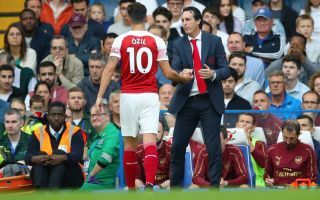 Metro Sport also states that that order came directly from Gunners boss Unai Emery, who is aiming to protect his player and keep him focused on his current duties at the Emirates. Ozil has flattered to deceive on the pitch in the first few months of the new season, with many pundits and supporters suspecting that he is still suffering in the aftermath of the controversial saga with his country. However, Arsenal are on a high having won their last 5 games in all competitions, heading into a Carabao Cup showdown with Brentford on Wednesday night. The midfield maestro is unlikely to feature in that particular contest but he should make a return to Emery’s starting line-up against Watford on Saturday, where Gunners fans will be hoping he can re-discover his best form and start to move on from his torrid experiences over the summer.